Meditation its Theory and Practice is about meditation as it is understood and done in the traditional schools of non-duality. According to the teachers of classical non-duality, meditation is one of the most important practices on the path to discovering the reality of our own nature in direct experience. The book begins with a presentation of the principles on which the meditations are based, and goes on to describe the practices in detail. These include breathing practices, visualisations, and meditations on texts indicating the nature of our true being, which is at one with the source and being of all. Meditation its Theory and Practice was compiled from the writings of Hari Prasad Shastri and first published in 1936. At this time there was little knowledge or understanding of meditation among the audience in the West for whom the book was intended. The non-dual teachings are based on the understanding that ultimate reality is one, not many, and that the reality within each apparent individual is not essentially different from the reality in all. The aim and purpose of the practical teachings is to discover in direct experience this identity. The practical path is a balance of deepening our understanding of this Truth, dedicating the emotions to it, and expressing it in our actions. 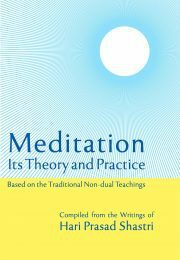 Meditation as it is explained and presented in this book, is for those who have begun to pursue this path in earnest. To help readers make the most of the book, in the latest edition, some structured meditation practice sets have been added. This book will be helpful and interesting to those who want to understand and practice meditation as it is given in the traditional non-dual teachings. Those who are doing the practices will find that they can read and re-read it and find ever new insights and guidance.